The jacket ordered came on time, was of high quality. Very easy to browse web site and place a specific order - delivery received as scheduled. 2 orders received. Another purchase from Brook Taverner arrived next day, perfectly packaged, contents far more than expected, my new green blazer on a super clothes hanger complete with stylish suit cover. What service and what a deal. Tried on to find blazer fitted perfectly. This is the norm and is why I will always buy from Brook Taverner. Delivery received the following day. Contents as requested packed to perfection with comprehensive information provided in the event of error or change if required. Very good quality clothing at excellent prices. Delivery is quick and fuss free. Also returns are taken care of equally Well. Having had delivery service issues with the couriers Brook Taverners customer service department quickly resolved the problem and I received my delivery within the hour. Very pleased with the quality of the product, as well as the speedy delivery. This Company's products are always of high quality and, when bought during one of their offer periods, excellent value. Great service, Good communication with the carrier ensured I was in when my order was delivered. Excellent quality and competitively priced. Good product; good discount; very prompt delivery; very helpful after sales customer service. Excellent product, price and service. Highly recommend. Will use again. Delevered quickley jacket fine good deal with coupon half price. Extremely efficient from placing the order to receiving the garment. Ordered in the afternoon, arrived midday following day. good fit and nice quality material. It would be good if they could supply a pocket sized patch for club badges/logos without having to buy a meter of material at £25. Overall I am very satisfied. Good consistent service and tailoring, with excellent delivery. 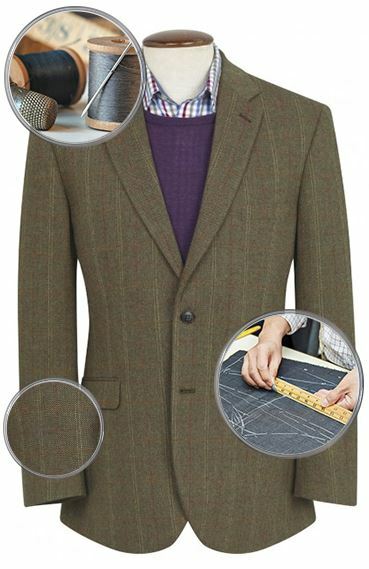 A company to be recommended for both speed of delivery, and response to returns I ordered a blazer from them which had to be returned trough no fault of Brook Taverner and received excellent service from them. I needed a new blazer for my captaincy at the golf club , saw one on your site ordered it and received it with in a week . Perfect fit thanks. Very easy ordering, goods arrived in most timely fashion and quality excellent. Very good selection of jackets and sizes. Goid quality and brilliant delivery service. 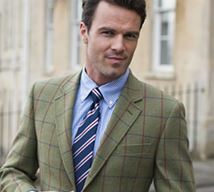 The items of Brook Taverner are of good value-price. It was my first order and i am fully satisfied. Especially of the customer service efficient to give a good information of the unfolding of the order and delivery,and to resolve any problem. I deeply recommand BT to my friends.I will order new items soon. The first jacket was too big ,sent it back smaller size arrived within three days fitted well! Excellent service ! Will be using them again. This was my first purchase from BT. Super impressed with the service equally so with the Blazer. BT can teach a lot of firms about customer service. Needed a green blazer as will be captain of my golf club next year. A previous captain recommended this company and I was not disappointed. The style, cut and fit are superb. My wife says it the best fitting jacket I have got! This is the first time I have purchased clothing from Brook Tavener and I have been very pleasantly surprised. The ease of purchase the speed of despatch and the superb quality and fit of the blazer is as the review title says outstanding. There is no doubt that my first port of call for future clothing purchases will be B.T. I have now bought two jackets (blazars) from Brook Taverner and they are the best that I have ever bought, and I have owned many, so without doubt they get my endorsement. The cloth is top quality as is the finish and the fit so you cannot ask for more. I have no reservations in recommending them. Blazer was exactly what I was looking for, delivered on time without any hassle, tracking worked 1st class and I knew where the jacket was all the time. Jacket arrived when promised and was as described in the advert online. Good quality merchandise,at the right price delivered promptly. As a first time purchaser I have been delighted with the service provided giving rapid delivery, a well made, excellent value product. I have already recommended to a friend who has had precisely the same experience. We will both be going to Brook Taverner again in the future. 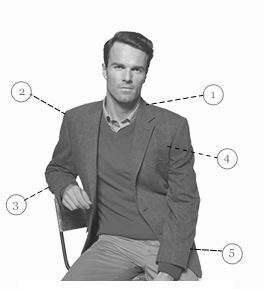 I sent for a jacket and trousers for my husband who is quite tall and slim legged so to get the correct fit with trousers can be a problem on times, a lot of them look too baggy on the back of the leg and bottom. The Chertsey flannel trousers are a lovely fit and the quality of the fabric very pleasing, the fact that they are half lined is a bonus. 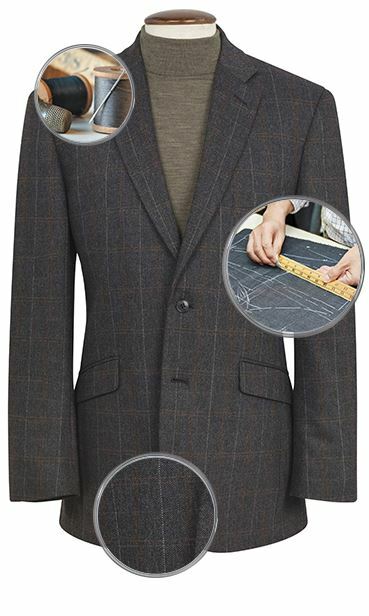 The Henley Club Blazer is also of good quality and we are pleased with the tailoring. We sent for the wine colour and it is much nicer than the picture depicts on the website (not so gaudy looking!). We were also very happy with the ordering and delivery service. Will order from this company again. Speedy,compact and polite and I am still in a chair! Purchased the jacket for a production of Hamlet in the open air.Polonius I hope will look wonderful.Pendley Shakespeare festival will publicise the jacket and I have the feeling that the actor will buy same jacket after the show.if I were he I know I would but alas we females............ Thank you. 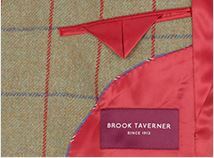 Brook Taverner have delivered in every respect! quickly and were expertly packaged. Full marks! Decided to buy a black blazer for my husband and found Brook Taverner on Google - he hates shopping for clothes and, additionally, few High Street menswear shops do blazers in black, just the normal navy, or some rather unconventional colours. Could not have been more delighted with the excellent service we received - the order was received within days. The Blazer is beautifully made, good quality cloth, looks really smart and fits perfectly. Would highly recommend Brook Taverner. Mary Poppins said "perfect in every way". Very pleased with my purchase and delivered sooner than expected. A good range of mens clothing that is both affordable and stylish. Excellent website and excellent promotional offers given throughout the year. A very good quality blazer. This blazer was an excellent buy, well made and a perfect fit, my husband was very pleased I purchased it for him. Will definitely buy from you again. My jacket was better quality and at a better price than anywhere I could find in the local stores. I have subsequently purchased 2 lambswool sweaters which I am equally pleased with. Supplier of good quality merchandise, what else is there to say. The jacket is good quality and fits perfectly. The measurements were stated accurately. Very fast delivery, less than 48 hours. No wonder the "returns" policy is so good, there is no reason to return!! I ordered a jacket late on a Wed. afternoon, it was delivered to me first thing Fri. morning. Excellent delivery service. Excellent, Prompt and Good Quality. Excellent service from start to finish.This company was recommended to me by a friend and I will be doing the same. Thank You . Good value for money and arrived within 3 days of ordering, great service. Quality products and service, this is is company to trust and who will deliver. I found every stage of the purchase straight forward. The goods arrived promptly and I am very pleased with the quality. I would recommend Brook Taverner to any friend or colleague; service that delivers. Righe colour, good design except the shoulder pads are too wide. There was 1inch overhang on each shoulder. Impressed with the excellent quality of this jacket and would recommend it. Find it a good fit. Have bought two colours. It's a very smart piece of work and I like it a lot Two problems: one of the pockets is mis-sewn so that change and kVRYPeys fall through into the lining. Very annoying. And I do agree with beckenbar's review that the sizing is maybe a bit on the small side. Nevertheless I will buy again! bought 3 different colours for different occassions. All excellent sizing, style, quality. very good value for money. Bought this jacket for my captains year at my local golf club. Really impressed with the quality and price (incredible value in the sale). Would definitely use again and recommend to others. Trying to find a really nice blazer for a hard-to-please but extra large husband isnt easy.....but Brook Taverner made it simple and trouble-free......HUGE THANK YOU! We'll be back! good quality but the size is a bit small. Great looking blazer, great fit and very good quality for the price. Gold buttons give it that extra quality look and the service was second to none ...love it. Good quality and delighted with the discount applied. An excellent jacket supplied with a good quality protective cover. I requested an additional swatch of fabric for embroidery of a club logo and this was provided FOC, delivered the following day. Good quality jacket. Fit was perfect. I would recommend Brook Taverner to anyone. A good quality and well fitting Blazer, it feels very comfortable when wearing. I like it. A good quality garment just what I have been looking for. Good quality, good fit and at a good price. Top quality blazer far better than you would expect at the price. Lovely jacket. Great quality and finish. The fit is perfect and feels good to wear. You can order this blazer in a size 48 Regular fit, and if the size is unsuitable, you can send it back to us for refund/exchange using our free of charge returns service. Needed a green blazer as will be captain of my golf club next year. A previous captain recommended this company and I was not disappointed. The style, cut and fit are superb. My wife says it the best fitting jacket I have got! As a first time purchaser I have been delighted with the service provided giving rapid delivery, a well made, excellent value product. I have already recommended to a friend who has had precisely the same experience. We will both be going to Brook Taverner again in the future. I am so pleased I ordered 2 items from Brooke Taverner. I am delighted with the 2 jackets and they were delivered very quickly and were expertly packaged. Full marks! Decided to buy a black blazer for my husband and found Brook Taverner on Google - he hates shopping for clothes and, additionally, few High Street menswear shops do blazers in black, just the normal navy, or some rather unconventional colours. Could not have been more delighted with the excellent service we received - the order was received within days. The Blazer is beautifully made, good quality cloth, looks really smart and fits perfectly. Would highly recommend Brook Taverner. A good range of mens clothing that is both affordable and stylish. Excellent website and excellent promotional offers given throughout the year. Excellent service. My jacket was better quality and at a better price than anywhere I could find in the local stores. I have subsequently purchased 2 lambswool sweaters which I am equally pleased with. The jacket is good quality and fits perfectly. The measurements were stated accurately. Very fast delivery, less than 48 hours. No wonder the "returns" policy is so good, there is no reason to return!! overall very impressed. Not sure what to make of buttons though. they look a bit false, but I'll see how we go with them. Fit and quality of material is very good .